TASTEVA® Stevia Sweetener delivers a better-tasting, natural solution that’s suitable for use in sugar-free, no-sugar-added and reduced-sugar beverages and foods. TASTEVA® Stevia Sweetener is significantly preferred over Reb A 97 when compared in formulated products and has a significantly lower bitter/liquorice taste. TASTEVA® Stevia Sweetener, a key element of our sweetener portfolio, minimises the bitter aftertaste of stevia that 80% of the population can taste. It eliminates the need to use masking ingredients in reduced-sugar formulations. 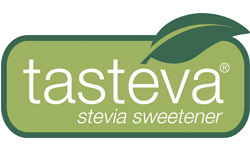 TASTEVA® Stevia Sweetener lets you formulate the natural products that your customers demand. A high-potency sweetener it is 200 to 300 times more sweeter than sugar. Stable in processing and storage over a wide pH range, TASTEVA® Stevia Sweetener is ideal for use in low-pH systems such as beverages. TASTEVA® Stevia Sweetener is easy to formulate with and ideal for use in a wide range of applications including beverages, dairy, baked goods, dressings and sauces, frozen foods, processed fruits and vegetables, snacks and cereals. Products included in the TASTEVA® Stevia Sweetener family are TASTEVA® and TASTEVA® M (Reb M Stevia Sweetener - approved for use in North America only). Learn about what makes TASTEVA® Stevia Sweetener one of a kind. TASTEVA® Stevia Sweetener lets you create better tasting products with lower sugar and calories, while offering consumers a natural, plant-based sweetness with a great taste. TASTEVA® Stevia Sweetener has a superior taste profile over Reb A 97 and other stevia products. A natural plant extract, TASTEVA® Stevia Sweetener meets with FDA GRAS specifications for steviol glycosides. TASTEVA® Stevia Sweetener offers a better-tasting, natural sweetener solution that’s suitable for use in a wide range of sugar-free, no-sugar-added and reduced-sugar baked goods. TASTEVA® Stevia Sweetener can be used in a variety of beverage products, from flavoured sparkling water to fruit juices, helping you to create better tasting products with lower sugar and calories. TASTEVA® Stevia Sweetener lets you create confectionery that offers consumers a natural, plant-based sweetness with a great taste. TASTEVA® Stevia Sweetener adds even more nutritional benefits to dairy, thanks to its stability in processing and storage over a wide pH range. TASTEVA® Stevia Sweetener can be used to create sauces and soups that are naturally lower in calories. Developed after a two year comprehensive research study, TASTEVA® Stevia Sweetener is produced using a proprietary process that enables formulating of stevia at higher use levels. TASTEVA® Stevia Sweetener is significantly preferred over Reb A 97 when compared in formulated products and has a significantly lower bitter/liquorice taste. Produced using an aqueous extract from stevia leaves, TASTEVA® Stevia Sweetener enables formulating at higher use levels. Its stability during processing and storage makes it easy to apply in combination with other products from our food and beverage solutions portfolio.